A young entrepreneur from Sheffield who recently scooped a top business award is on course for more success thanks to support from an international training and development organisation. Lewis Bowen, who runs Geco Industries, scooped the Young Business Person of the Year accolade at the Sheffield Chamber of Commerce’s Sheffield Business Awards and, as part of his win, is set to begin a leadership course specially designed for high potential, early career individuals. The Common Purpose Navigator course, run by not-for-profit organisation Common Purpose, aims to bring together high potential, early career individuals from a range of backgrounds on a local, regional, national and international basis. Lewis, 25, will be joined by other young business people from across the North of England for the three-month course. This course is a fantastic opportunity to get together with different people from a variety of sectors and backgrounds, as there is so much to be learnt from them. Following the course, Lewis will become part of the Common Purpose Alumni network of more than 1,000 other people in the region, and 40,000 alumni who will have access to further events and opportunities offered by Common Purpose. Common Purpose is a fantastic organisation which provides such vital support for business people and I’m extremely grateful to them for giving me the opportunity to be a part of one of their courses. Lewis launched Geco Industries in 2011 to provide environmentally friendly and safer fuel options across Africa to tackle the problems of indoor air pollution in the country. The company’s product, Fuel4, is a bio-ethanol gel fuel which is smokeless and non-toxic providing an efficient and safer cooking and heating solution for the outdoors industry, services and communities. Geco, which is made up of a team of eight, is based at Hillfoot Industrial Estate, and is currently in the process of developing further products to add to its Fuel4 range. The Navigator course is for people in the early stages of their career, who already have some management responsibility and are tipped to be the leaders of the future. Lewis fits this bill perfectly and we hope to see him benefit hugely from what the course has to offer. 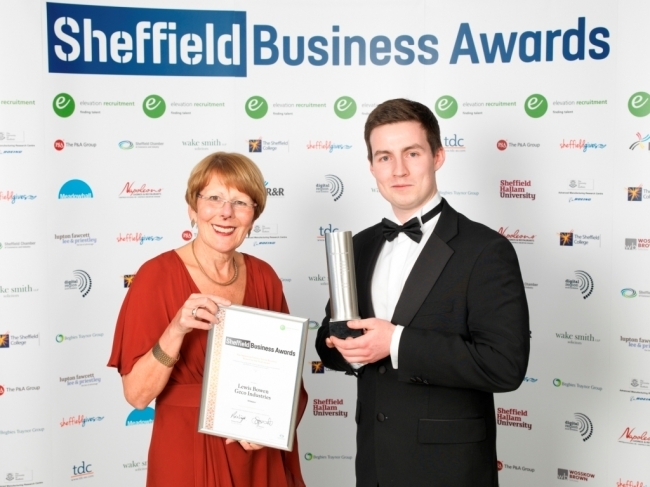 Lewis Bowen (right) managing director of Geco Industries with his Young Business Person of the Year award, presented by Heather MacDonald, chief executive of Sheffield College.